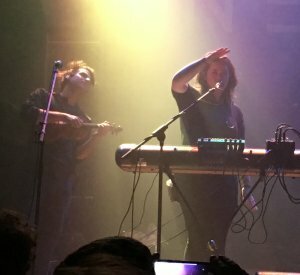 As Bent Knee take to the stage for the final night of their European tour supporting Haken, they are greeted by a healthy crowd curious to find out what this Boston band have to offer. Guitarist Ben Levin announces that it’s going to be a party, and there is clearly an air of great enthusiasm on stage. 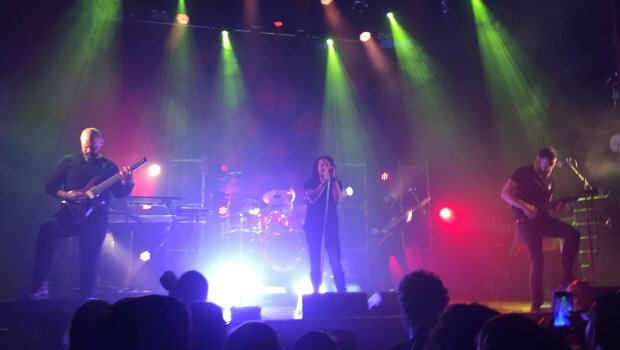 Our attention is captured right from the opening song Bone Rage, with vocalist and keyboard player Courtney Swain a commanding presence centre-stage. Her voice is an obvious asset which immediately sets this band apart, but the song structures and whole approach is quite unlike any other group I can think of. With the plethora of talented and dynamic ensembles around at the moment, managing effortlessly to be unique is something of an achievement. The rhythm section of Jessica Kion (bass) and Gavin Wallace-Ailsworth (drums) are both strident and subtle in the space of a few moments, while Ben’s guitar style seems more textural than flash. The sound is rounded out by Chris Baum on violin and Vince Welch the ‘sound designer’, whatever that may entail. The whole cocktail is intoxicating, and somehow proves to be quite accessible despite its complexity and unusual form. By second song Leak Water, they are already hitting their stride and clearly enjoying the positive response. The songs ebb and flow, with crushing beauty one moment, and almost ambient textures the next. 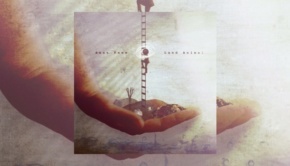 You can’t look away for a second, Bent Knee demand your attention, and it is freely and gladly given. My expectation of Bent Knee as a Prog band is quickly being rethought. This collective are really difficult to pigeonhole or even describe. I’ve heard them called ‘art rock’, and if you like that term, fine. It seems to me that labelling in this instance is rather futile, because as soon as you think you have them sussed, they take a left turn into quite different territory without even warning you by indicating! These twists and turns might sound disjointed, but never are. It all seems so organic and natural, and simply right. The performance steadily gains momentum, Chris plucking his violin one moment, and bowing the next adding a melodic layer to the sound. In the rockier moments, Ben and Jessica jump around the stage revelling in their creation. Ultimately though, all eyes return to Courtney whose voice moves from near whisper to scream in a heartbeat. The songs are not long, yet have more ideas packed into five minutes than many bands manage on a whole album. Whilst opening for an established band is an advantage in terms of providing publicity and exposure, which they richly deserve, the drawback is that they only have a very limited time on stage, and we only have time for six songs tonight, but those six will have convinced many, like me, that this is a band which must be investigated further, and with some urgency. I feel sure that they will return to these shores soon, and I would earnestly recommend you catch them if you get half a chance. 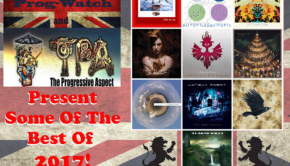 If you like your music truly progressive and perhaps a little challenging, they will not disappoint. Can I put in an early bid to get them on the bill for Summer’s End 2020? It’s almost exactly eight years since I first encountered Haken, at a packed Peel in Kingston-on-Thames, a few months before the release of Visions. I remember Ross Jennings shaking the hand of every member of the audience on their way out, and being amazed that I’d not heard of them before then. They’ve come a long way since then of course, but the promise was obvious even then. So fast forward to 2019, and the last night of the Haken European tour in support of Vector, and something of a triumphant homecoming. There’s no sense of complacency however, the band ripping into The Good Doctor with panache, and following that with the killer Puzzle Box and its staccato riffing energising the crowd. This opening pair from Vector are a statement of intent, and we get plenty more from the new album as the set progresses. Ross Jennings strides the stage as if he owns every inch, the rhythm section of Connor Green and Raymond Hearne locking down tight as the ideal base for Rich Henshall, Charlie Griffiths and Diego Tejeida to weave their guitar and keyboard magic. The newer songs are from the heavier end of the band’s repertoire but are deceptively complex, despite this the guys have this material well and truly nailed at the end of the tour. It’s almost a relief to go back to The Mountain next, Falling Back To Earth providing a slab of the more melodic proggy side of the band. Haken now have the sold out crowd in the palms of their collective hands, and they can do no wrong. After another pair from Vector, we go back to 1985. 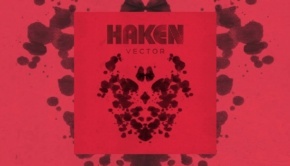 I know some who weren’t keen on the ’80s stylings of parts of Affinity, but for me it was a masterstroke, keeping Haken ahead of the pack in terms of innovation and surprise, and this song just works a treat as a contrast to the Prog-metal of recent songs. The set closes with The Architect, a fantastic track which exemplifies everything great about this group. There is heavy sweeping drama, a short growly vocal bit, and the extraordinary Crimson inspired instrumental mid-section. 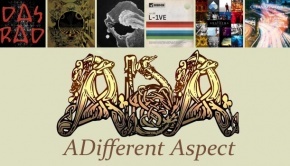 Home grown progressive rock doesn’t get much better than this. The triumphant encore of Crystallised morphs inexplicably into Toto’s Africa, with band members from Bent Knee and Vola joining in the chorus. Crazy stuff, but great fun. The only slight downer for me was the insistence of a few in the crowd in indulging in a bout of moshing, caring not for those around them, inspired I guess by the fast and furious songs from Vector, but as one observer noted, we need to encourage young people to support live Prog, so I’ll not dwell on it. The simple fact is that Haken are on a deserved high, and they’re only heading upwards. I shall still be with them every step of the way, no question.